Perforated metal is one of the most versatile and popular metal products on the market today. Perforated sheet can range from light to heavy gauge thickness and any type of material can be perforated, such as perforated carbon steel. Perforated metal is versatile, in the way that it can have either small or large aesthetically appealing openings. This makes perforated sheet metal ideal for many architectural metal and decorative metal uses. Perforated metal is also an economical choice for your project. Our perforated metal filters out solids, diffuses light, air, and sound. It also has a high strength-to-weight ratio. Square Hole Perforated Metal is an ideal option when a greater open area is required in a project. 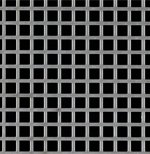 Our square hole perforated metal is extremely versatile and lightweight. We carry a diverse selection of staggered or straight row patterns in a wide variety of hole sizes, gauges, and materials. Slotted Hole Perforated Metal can provide greater ventilation and passage of material than the round hole perforation. There are many slot sizes, pattern layouts, material types, and gauges that are available. Decorative Perforated Metal is an ideal option for many architectural metal applications that require an aesthetic appeal. 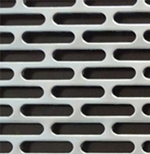 Decorative Perforated Metal offer design options with a wide array of hole shapes, gauges, and materials, such as perforated steel, aluminum, stainless steel, and galvanized steel. Many unique designs can be achieved with Decorative Perforated Metal. Architectural Perforated Metal is extremely versatile and lightweight. It comes in round, square, slotted and decorative perforations. 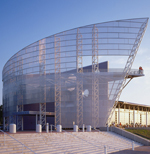 Some architectural perforated metal applications include sunscreens, ceiling panels, and exterior cladding. Hexagonal Perforated Metal features the highest open area of all perforated metal types. 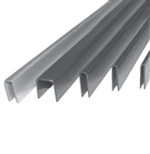 It is primarily used for high airflow and architectural metal applications. 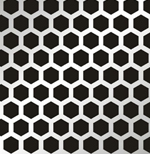 We carry hexagonal perforated sheet metal in a variety of gauges, hole sizes, patterns, and materials. Perforated plastic sheets come in both PVC and polypropylene materials. Polypropylene is the more flexible plastic perforated sheet. Polypropylene offers good chemical resistance to organic solvents with degreasing agents. PVC plastic perforated sheets offer better impact and abrasive resistances. U-Edging is a perforated metal accessory that is a u-shaped strip that attaches to the edge of a perforated metal sheet to make the edges more attractive and safer. Q: Can perforated sheet be plastic coated? A: We don’t plastic coat perforated sheet, however we can perforate a plastic sheet. Q: Why is perforated sheet protected with a thin layer of oil? A: Lubricating oil is used to reduce the friction during the perforating process. Q: Can perforated sheet be formed after perforating? A: We can shear and form perforated sheet to any specification needed. Q: What opening types are most common in perforated sheet? 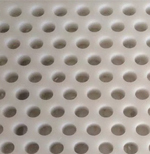 A: Round, rectangular, and slotted perforated sheet are very popular options. 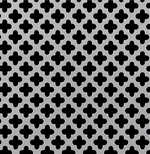 See our decorative perforated sheet for more unique styles. Q: Which perforated sheet materials are rust resistant? A: Perforated aluminum, stainless steel, and galvanized perforated steel are the most rust resistant materials that we perforate. Q: Why is perforated sheet commonly used? A: Perforated sheet is used for a variety of applications because of the hole size options, percentage of open area, high strength-to-weight ratio, and aesthetic appeal. Q: Can I choose the material type for my perforated metal sheet? A: Yes, there are many material options for your perforated sheet order. 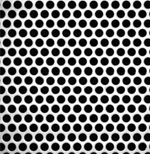 Perforated steel comes in both stainless perforated steel and carbon perforated steel. You can also choose aluminum perforated sheet. If you need help deciding between perforated steel, perforated aluminum, and other material options, you can learn more in our Perforated Metal Catalog.